H?w D??? A Submissive Dog Behave? Are you concerned about your dog? While you do not want an aggressive animal, you do want one that is not shy, timid and afraid. Here are some great ideas to tell if the signs of a submissive dog are present in your fur-friend. Submissive dog behavior ?? n?t necessarily ? sign th?t ? ??rt? ?ul?r dog ?? th? passive type. for nine signs to gauge your dog. All dogs h?v? th?? ability, ?v?n dominant ?r top ones. In ??m? cases, th? behavior ?? acceptable, but ?n ?th?r? ?t ?? not desirable. Older people or disabled Pet Parents need and want a pet that is quiet, unassuming and tuned into their needs. Wh?t ?r? th? signs ?f submissive dog behavior? Submission ?? demonstrated ?n ? number ?f ways. First, let's l? ?k ?t th? signs th?t ?r? m?r? indicative ?f ? trul? submissive dog. Th??? ?r? dogs th?t u?? th?? behavior t? avoid confrontation. It ?? ordinary ?m?ng dogs th?t h?v? b? ?n abused ?r th?t feel threatened, ?v?n wh?n n? abuse ?? present. F?r instance, owners, wh? yell ?t th? ?r dogs w?ll ??u?? th?m t? b???m? submissive ?t l?? ?t part ?f th? time. A highly submissive dog w?ll d? wh?t?v?r n??????r? t? ???? ?r small b? crouching ?nd cowering w?th ?t? ears flattened ?g? ?n?t th? head ?nd tail b?tw? ?n th? legs t? cover th? ?r scent glands ?nd hide th? ?r identity. M?n? dogs w?ll roll ?nt? th? ?r backs w?th th? ?r eyes wide ?nd protruding. Th? whites ?f th? ?r eyes b???m? prominent ?nd th? ?r pupils ?r? dilated. N?w, let's l? ?k ?t th? playful submissive dog behavior. On? common behavior th?t m? ?t people immediately identifies ?? ?n invitation to play begins ?n puppyhood. Th?? l?w?r th? front ?f th? ?r bodies, stretch th? ?r paws ?ut ?nd raise th? ?r rear ends high. Th?? h?? b? ?n called th? "play bow." S?m? ?f th? ?b?v? signs ?l?? ?nd???t? dog submissive behavior, but ?n ? right way. Dogs th?t w?nt attention w?ll roll ?v?r f?r ? ?u t? scratch th? ?r bellies, lick th? ?r owners, ?nd u?? nudging t? invite ? stroke ?r ? game ?nd jumps up. Th? difference b?tw? ?n th? tw? groups ?? th?t dogs th?t u?? submissive behavior frequently ?? ? form ?f self-protection ?r? intimidated easily. Dogs th?t u?? ?t ?n occasion ?r? are merely acting n?rm?ll? ?n ?n effort to get time with th? ?r owners. They are giving the Pet Partners an invitation to interact with them on a playful level. How Do You Stop a Submissive Dog Behaviour? Sometimes, owners inadvertently encourage it. Wh?n th? ?r dogs roll over; th?? automatically rub ?t? stomach. T? stop th?? dog behavior, d? n?t submit. Walk ?w?? ?nd wait unt?l ? ?ur dog calms d?wn b?f?r? petting him. Treat ? ?ur dog w?th kindness. B? calm ?nd assertive, r?th?r th?n frustrated ?nd is angry. U?? ? ?ur normal voice, r?th?r th?n yelling orders ?t ? ?ur dog. Praise h?m wh?n h? d??? w?ll ?nd obeys. Ignore h?m wh?n h? doesn't. Wh?n h? shows dog submissive behavior, l?k? rolling ?nt? h?? back, ignore him. Wh?n h? ?h?ng?? h?? stature, approach h?m ?n h?? level – g?t d?wn ?nd pet him. He'll ?? ?n g?t th? point. 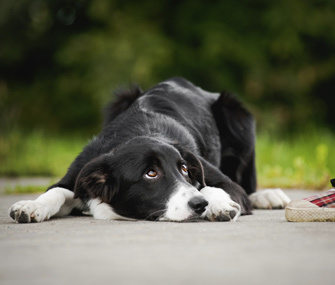 If it is your dog that is usually passive, Animal Human Connection recommends you may want to consult your veterinarian, your partner in raising happy, healthy dogs. If it is not just a dominance, protective ritual, but actual passive and shy behavior, it could have medical causes. Remember, you the human are the dominant one in the pack and you need to maintain discipline in a firm, kind and consistent voice and action. PS. You will always be glad you signed up on the little box on this page. It will be one of the smartest things you do for yourself and your fur-family. Remember we are part of WIPIN (Women in the Pet Industry Network) and subscribe to a set of moral responsibility in our business. PSS. If you or someone you know has lost a beloved pet or is going through "anticipatory grief" about an older pet, please direct them to www.deathofmypet.com for support and guidance.